4 Actions as events Our actions are events. Therefore, they have causes. Given the causes they have, no action is possible other than what we actually do. 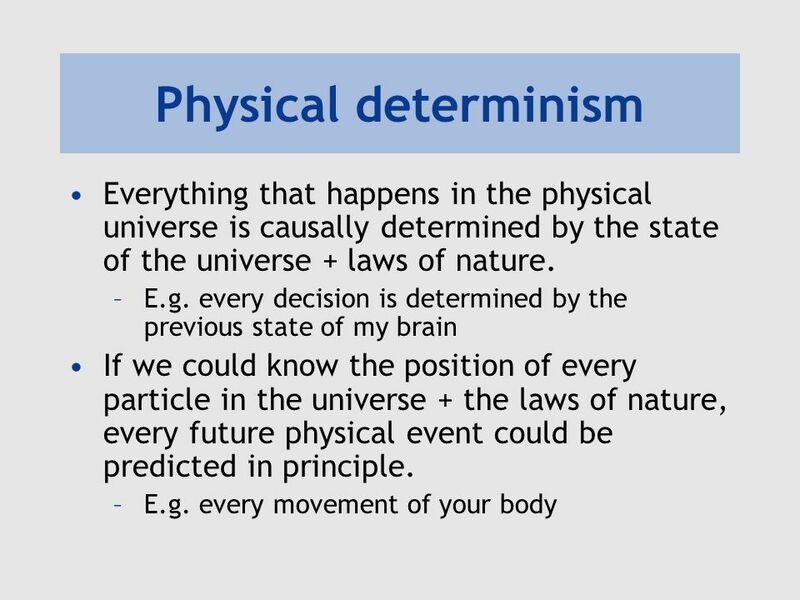 If we couldn’t do any other action, then we do not have free will, e.g. 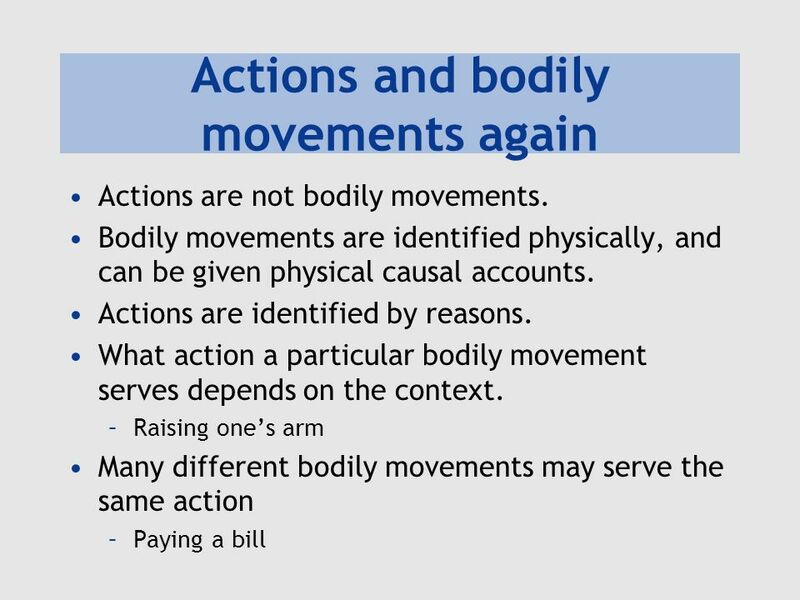 to choose between doing different actions. 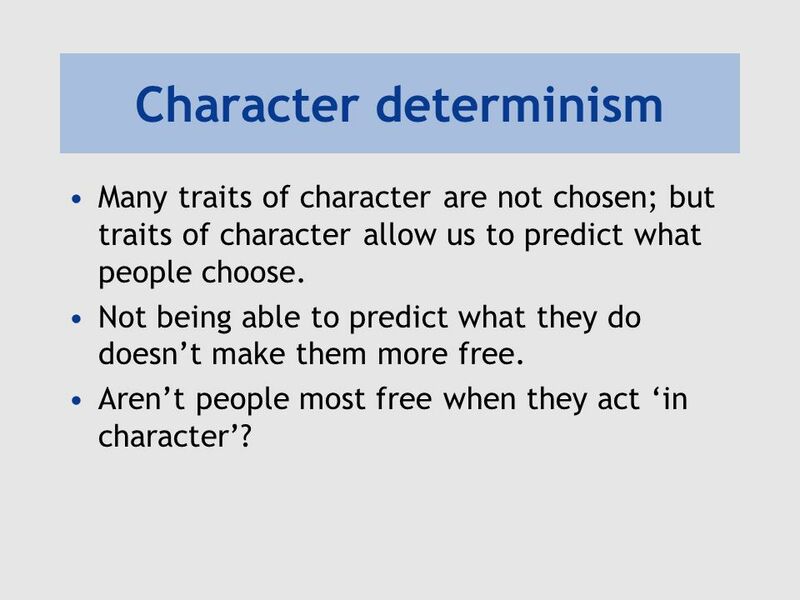 Many traits of character are not chosen; but traits of character allow us to predict what people choose. Not being able to predict what they do doesn’t make them more free. Aren’t people most free when they act ‘in character’? Being able to predict what someone will do isn’t enough to show that they aren’t free. 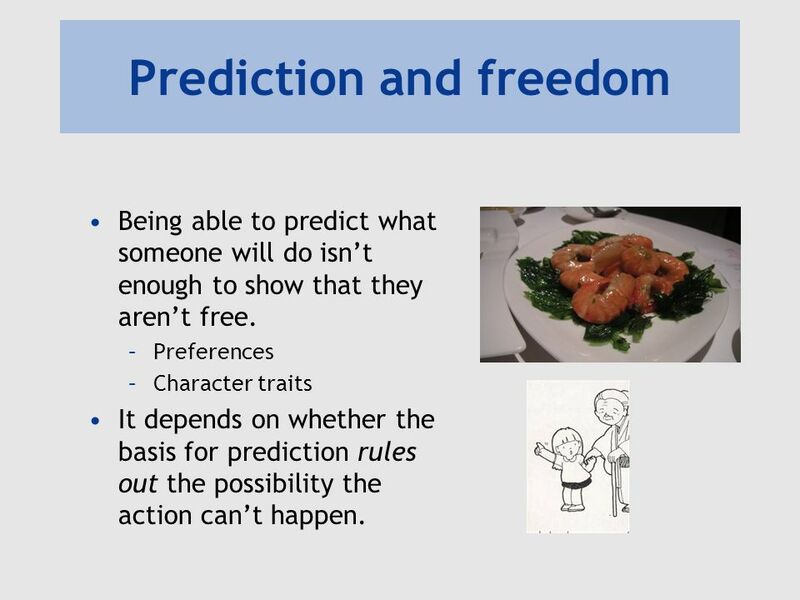 Preferences Character traits It depends on whether the basis for prediction rules out the possibility the action can’t happen. 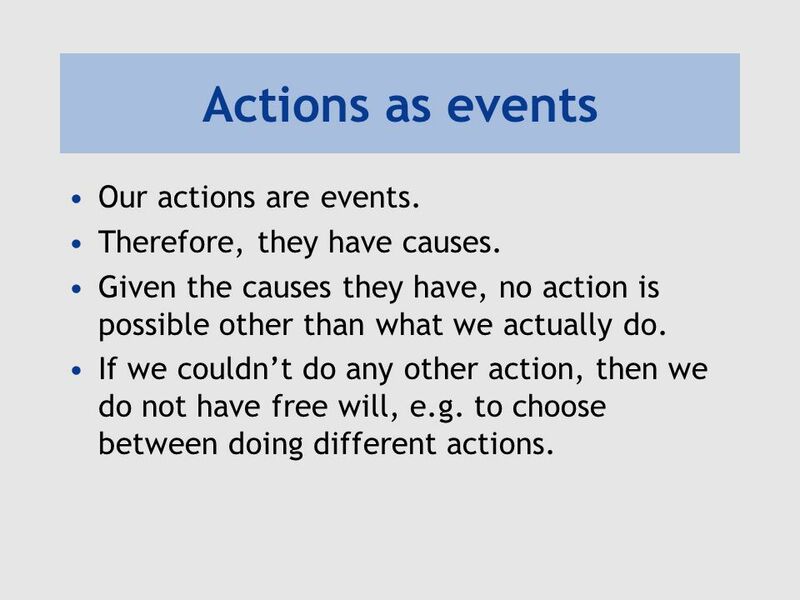 There is an important difference between how we explain what we do (actions) and things that just happen (natural events). 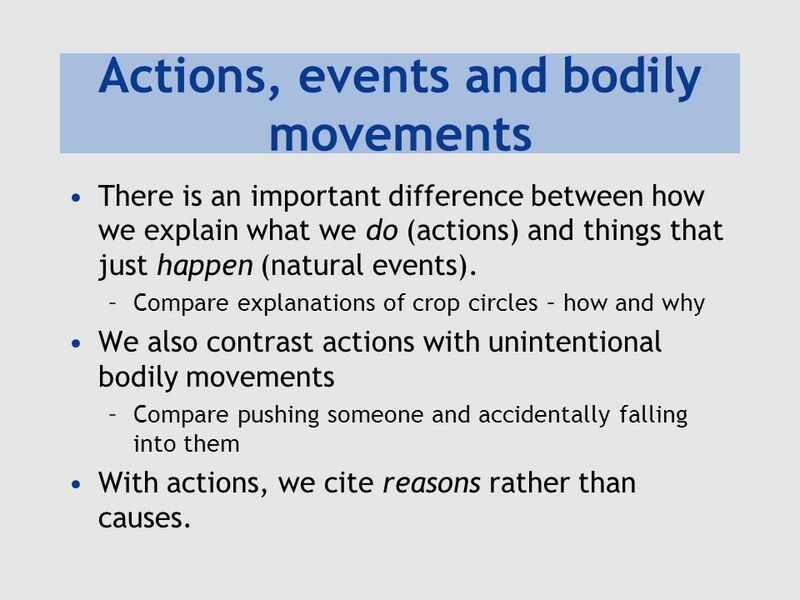 Compare explanations of crop circles – how and why We also contrast actions with unintentional bodily movements Compare pushing someone and accidentally falling into them With actions, we cite reasons rather than causes. 9 Reasons and causes Causes precede their effects in time. Reasons do not need to. If I give money to charity because it helps the needy, ‘charity helps the needy’ is not something ‘occurs’ before I give money (it doesn’t occur in time at all). Reasons can cite purposes – ‘in order to…’. 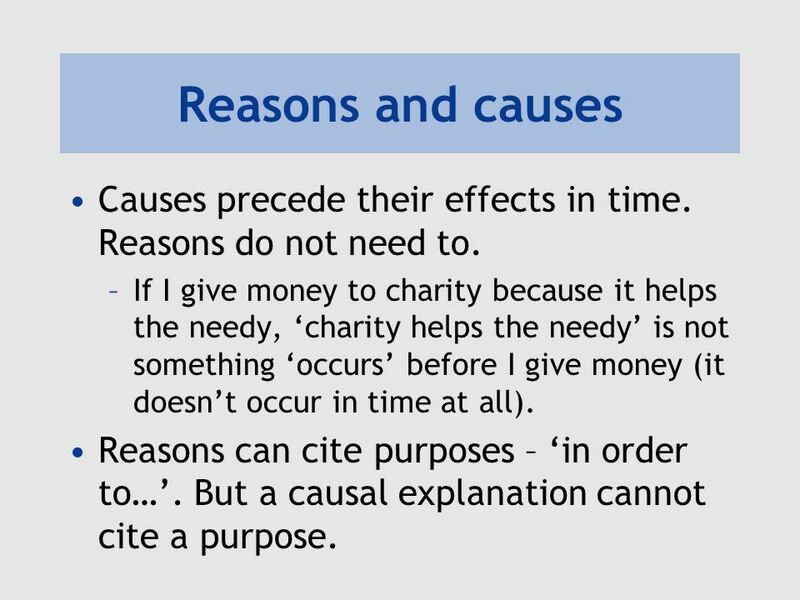 But a causal explanation cannot cite a purpose. 10 Reasons and causes Reasons can be ‘good’ or ‘bad’. 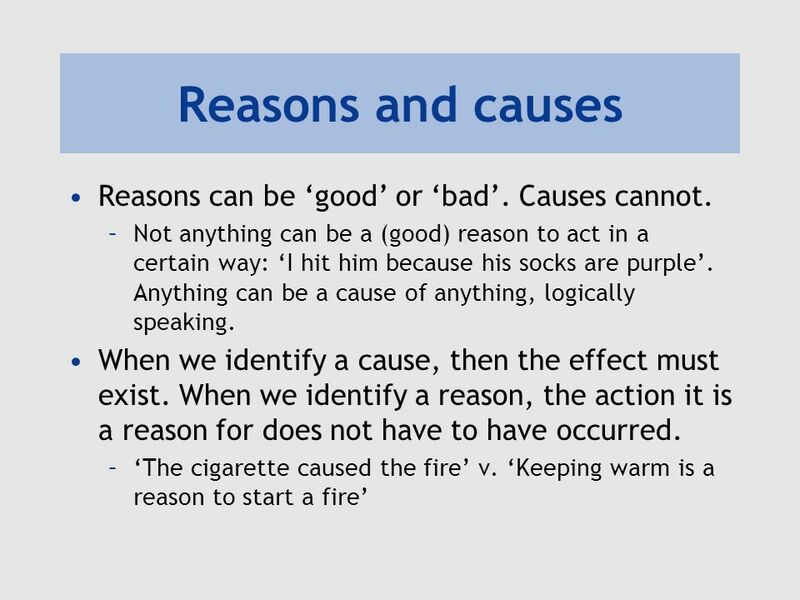 Causes cannot. 12 Moral responsibility Intuitively, we only blame someone if they could have refrained from acting as they did. 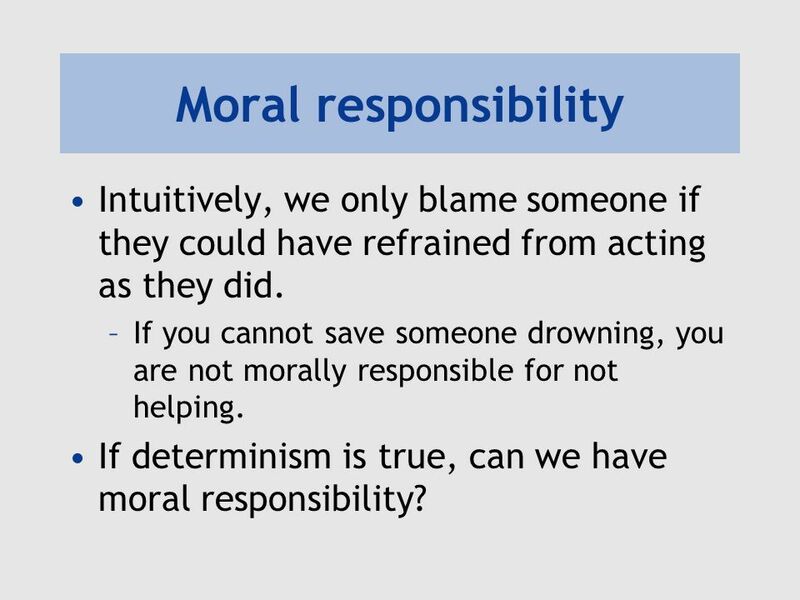 If you cannot save someone drowning, you are not morally responsible for not helping. 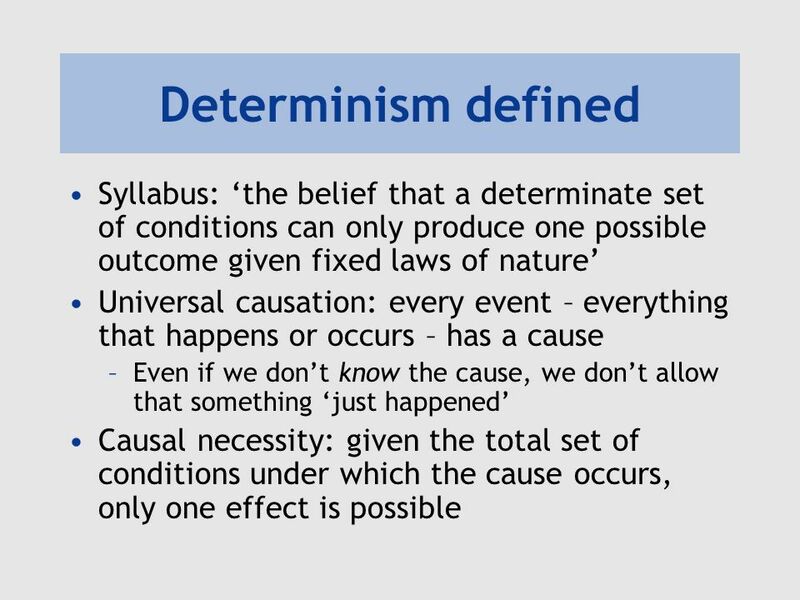 If determinism is true, can we have moral responsibility? 13 Ought implies can If there is something that you ought to do, then you are able to do it. So if you ought to have acted differently, then you could have acted differently. If you could not have acted differently, it makes no sense to say that you ought to have acted differently. 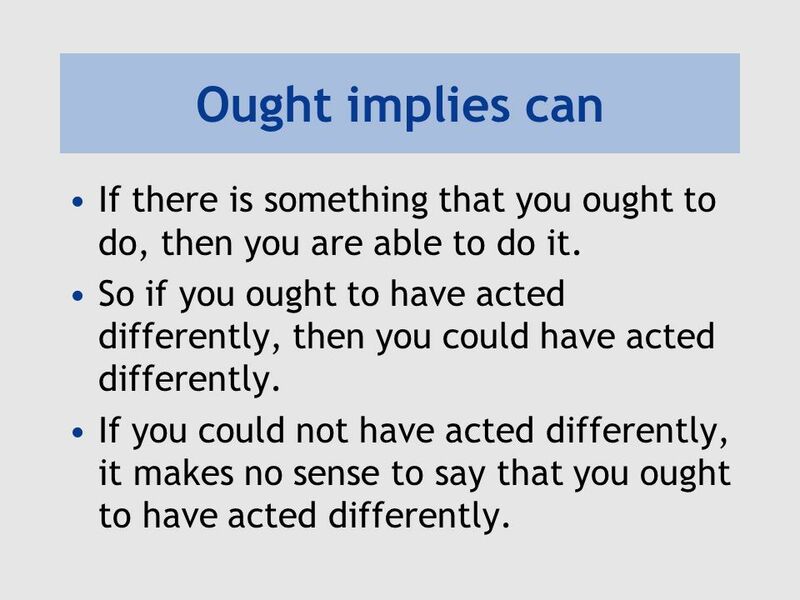 Accept that ought implies can and argue that there is a relevant sense in which a person could have acted differently, even though determinism is true, and so they are morally responsible. 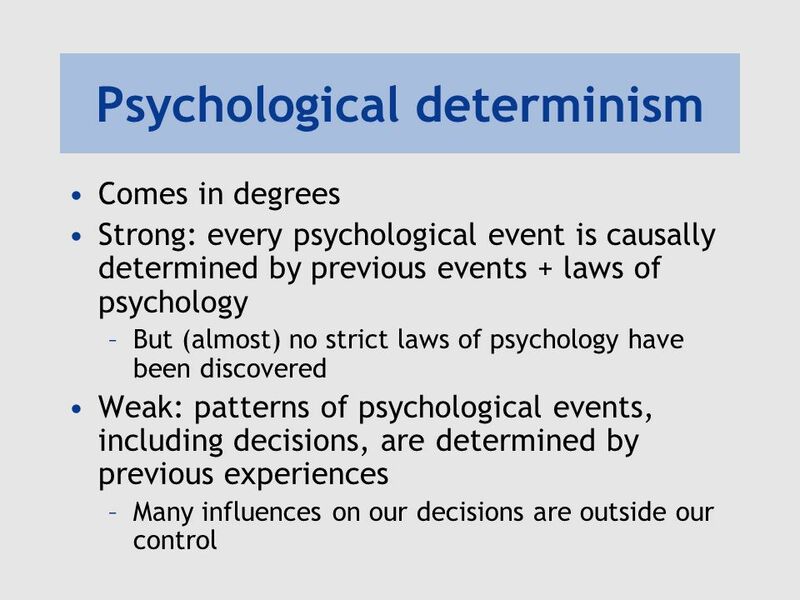 Argue that issues of determinism and ‘ought implies can’ are irrelevant to moral responsibility. 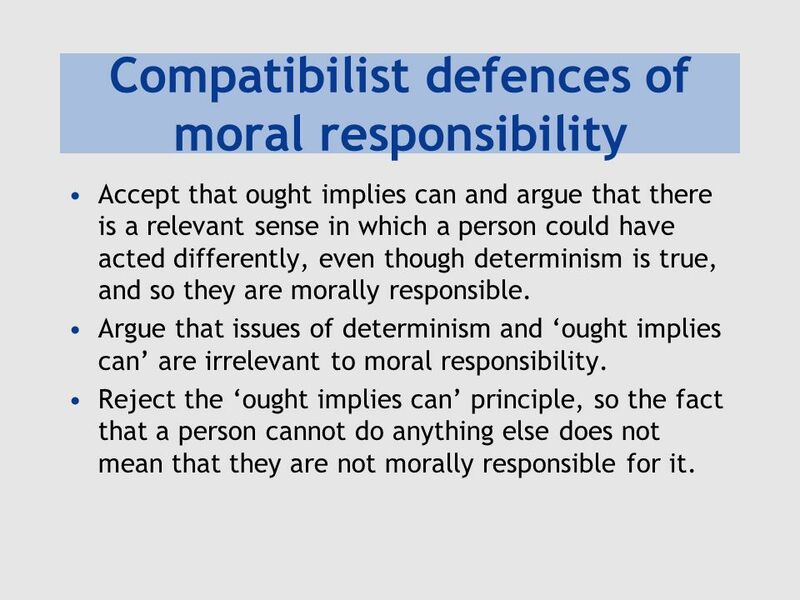 Reject the ‘ought implies can’ principle, so the fact that a person cannot do anything else does not mean that they are not morally responsible for it. 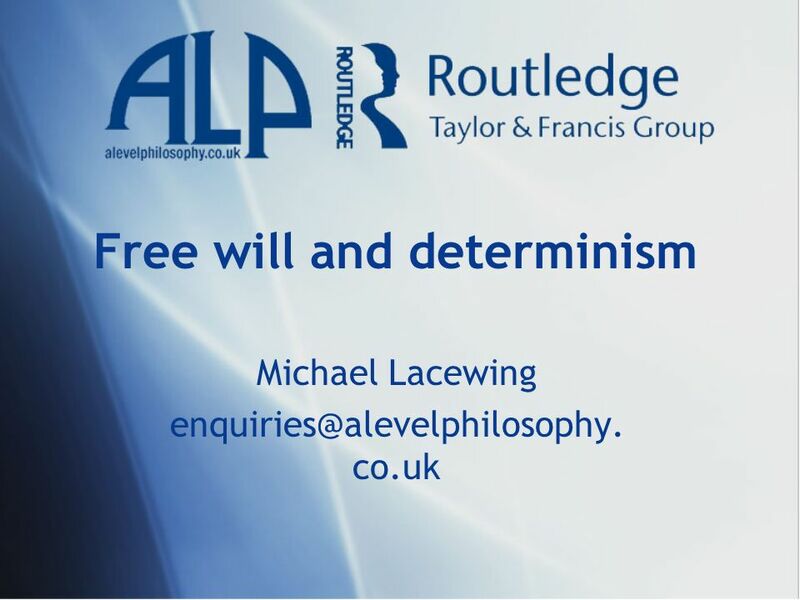 Download ppt "Free will and determinism"
Explaining the universe Michael Lacewing co.uk. Michael Lacewing Is the mind the brain? Michael Lacewing © Michael Lacewing. A2 Ethics How to assess arguments and theories. Aims  To discuss various methods of assessing arguments and theories  To apply these methods to some. Authority 2. HW 8: AGAIN HW 8 I wanted to bring up a couple of issues from grading HW 8. Even people who got problem #1 exactly right didn’t think about. Foreknowledge and free will God is essentially omniscient. So assuming that there are facts about the future, then God knows them. And it’s impossible. 1 Hypothesis Testing Chapter 8 of Howell How do we know when we can generalize our research findings? External validity must be good must have statistical. “… if (the best philosophy) doesn ’ t seem peculiar you haven ’ t understood it ” Edward Craig.